The Grandezza tonearm’s packaging tells you right off that someone really cared about this tonearm. It comes in a big beautiful wooden box. The inside has dense foam with precisely fitting cutouts for every part and tool. This kind of attention to detail in the packaging should be expected at this price point, but still it’s the most beautiful and thorough packaging I have ever seen. In my review of the InUniSon turntable, I shared Peter Brem’s story and how it’s not so different from a number of audiophiles I know. 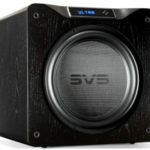 His audio journey started pretty much the same way as it does for most audiophiles. 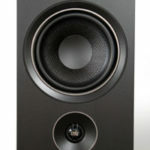 He bought a nice high-end system, and started to read more in audio journals. Then he found himself on the slippery slope of upgrading, and that became an endless story of frustration. Sound familiar? Then comes in Peter Brem’s story what I call a light bulb moment. According to his web site, he was trying to decide whether he wanted to continue to listen to music or to start golfing in a big way. He decided to listen to music. So he sold his expensive high-end gear and got a Klipschorn and a 300B amp. For a while he just enjoyed music, but this actually was the starting point of his building his own equipment. He quickly realized his earlier studies in electronic engineering would finally prove to be useful. His first creation was a large horn based on an Altec driver from the old cinema world. 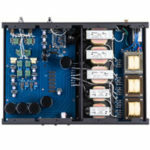 He then built a matching amp with a 300B, a VT52, and a RE604 and so on, then phono and line amplifiers in SRPP technology. He was really enjoying listening to this mono system. Then, in 1988 his real adventure began. On his website Peter Brem says, “there is no right or wrong – there is only music and how it reaches your soul. 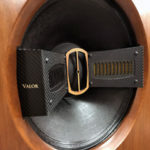 When music touches your soul, when it moves you, can it be wrong?” I think this story is important in understanding how DaVinciAudio and Peter approach the design of audio equipment. This brings us to the DaVinciAudio Grandezza reference tonearm. DaVinciAudio says, the most important aspects in the development of the tonearm Grand Reference Grandezza was to reach the highest musicality. They used crucial selection of materials in regard to comportment of resonances, weight distribution and the high precision in the processing. Their design goal was to achieve the highest degree of musicality and remarkable precision with the Grand Reference Grandezza. One last design goal was to make a precise and sophisticated tonearm that was easy to use and set up. In my review of the DaVinciAudio In UniSon turntable I commented that while it was built with all the precision of a fine Swiss watch, it was rather plain and blocky in appearance. The Grand Reference Grandezza twelve-inch transcription tonearm, on the other hand, is a visually stunning, genuine work of art. The wood and metals come together like beautiful artwork, and the bearing assembly is built with all the magnificence and detail we have come to expect from the Swiss. The heart of the bearing assembly is a double-gambled ruby bearing system. The ruby bearing technology was created by a renowned Swiss clock manufacturer. This bearing assembly is based on cardan joints, similar to the suspensions used in mechanical chronometers found in ships of eras past. 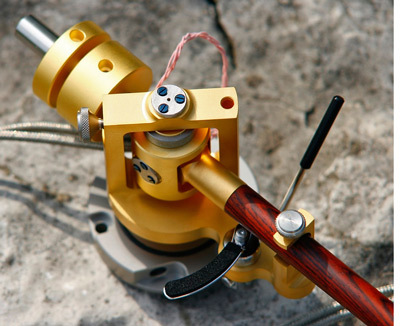 The tonearm tube is made of Cocobolo wood, a tropical hardwood from Central America. It is exceptionally hard, fine textured, and very dense. Still, it is easily machined and holds up well to repeated handling. This may be the reason it is use for gun stocks on very expensive rifles, shotguns, and pistols. If the sound of this arm is any indication, Cocoblolo is actually a great wood for tonearms, as well as being just plain beautiful. The Cocobolo arm tube terminates on one end into a graceful brass head shell; the review unit was covered with in a beautiful platinum finish. On the other end of the arm tube, you find the bearing block that is made of bronze and steel. The counterweights are made of copper wolfram, and it uses magnetic damping which, combined with the twelve-inch length, does away with the need for anti-skating. I think this is a good thing since it is so difficult to ever get anti-skating set just right. I need a hax a wranch for tone arm adjustment. Where can I get one and what size is that?